Pyosepticemia ("rotten-geeklove") - a little less heavy and slower flowing form of sepsis. In this form of the disease blood is mainly transmitted by microorganisms from a local source of infection to distant organs and tissues, where they settle, causing the formation of metastatic abscesses. These ulcers in turn can be sources of further metastasis. The blood itself in this form of sepsis affected less than septicemia. Pyosepticemia often occurs when staphylococcal infections. If septicopyemia the formation of ulcers accompanied by intermittent fever. The blood gets a new portion of microbes accompanied by spectacular chills, and then increasing temperature. For septicopyemia can be lengthy. Metastatic abscesses usually malevolently, inflammatory reaction of the surrounding tissues sluggish. Such ulcers often not recognized, however, they serve as a source of further metastasis. Blood cultures during the chills (receipt of germs in the blood) can detect the microflora, and the nature of its blood and metastases are the same. The forecast in this form of sepsis more encouraging than in septicemia. When pielii ("geeklove") between the appearance of metastatic abscesses of the General phenomena (rising temperatures, changes in the blood) are missing, the blood planting sterile. This form of sepsis is characterized by a lengthy course with a more favorable prognosis. Sepsis is usually attached to the existing purulent process (abscess, phlegmon, carbuncle, and so on). In rare cases the septic process remains undetermined, although it is likely there is a basis to assume as a cause of sepsis and the availability of timely unrecognized and therefore untreated the infection. In these cases, talk about "cryptogenic" sepsis. The nature of the flow sepsis divided into lightning, acute, subacute and chronic. Fulminant with the death of the patient within a few days and even hours is only possible with septicemia. Chronic sepsis often occurs as pyemia, with metastatic abscesses are formed from time to time (sometimes within a few months), the disease lasts for years. Surgical sepsis is the most severe complication of open injuries and surgical wounds. Among the open lesions of the soft tissues, organs and cavities have a great danger in the development of sepsis crushed, torn wounds, creating most favourable conditions for the life and reproduction of microbes. In cases of the operative trauma and sepsis may develop after removal of foreign bodies, if it violates demarcates the capsule; the operation itself can also lead to activation of dormant infection. Opening purulent foci of infection may lead to the development of sepsis due to damage the protective shaft and into the blood of germs. Contribute to the development of sepsis, shock, acute and chronic anemia, malnutrition, repeated trauma, metabolic disorders, elderly age. When odontogenic (oral) sepsis great importance as a reason given to dental caries, root granulomas, inflammation of the periodontal tissues, phlegmon of the floor of mouth, sore throat Ludwig (see). Except for General for signs of sepsis, when oral sepsis has increased and painful swelling of the submandibular and cervical lymph nodes. Fig. 1. Scraping the spleen in sepsis. Fig. 2. Bleeding into the adrenal gland. Fig. 3. Liver anaerobic sepsis. Fig. 4. 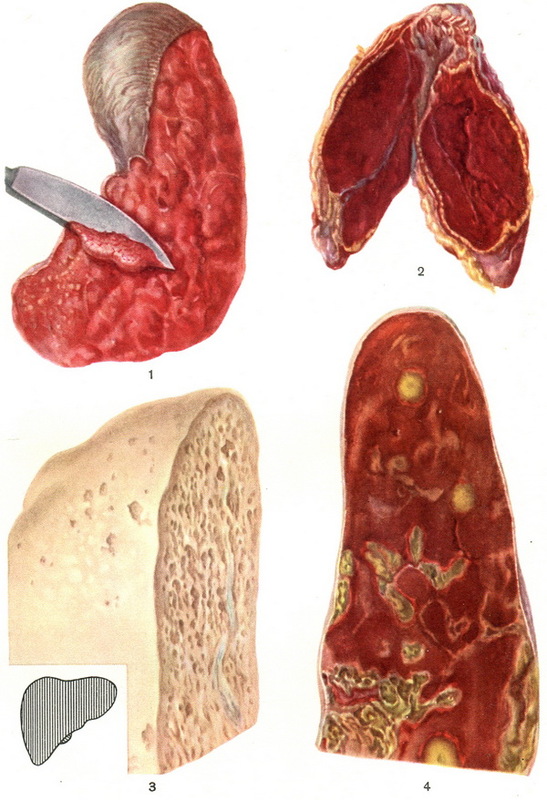 Multiple abscesses of the spleen. Fig. 1. Septic wound. Fig. 2. Embolic abscesses of the kidneys when septicopyemia. Fig. 3. Embolic abscesses of the brain in septicopyemia.